The Semester of Our Discontent, the debut novel in Cynthia Kuhn’s academic mystery series, is currently nominated for an Agatha Award for best first novel, so you can imagine that anticipation of book two is running high. 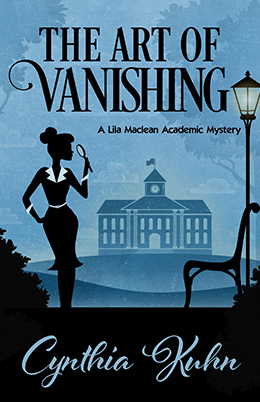 Fortunately, The Art of Vanishing is almost here and readers are going to be more than pleased with the way Cynthia has continued the journey of Lila Maclean. As with the debut novel, The Art of Vanishing once again finds Lila struggling to fit in at her new job with Stonedale University. The chancellor and other teachers remain wary of her because of her involvement in the previous novel’s murder investigation – not to mention the natural competition inherent with university hierarchies. Legendary author Damon Von Tussel is due to speak at the University during the upcoming Arts Week festivities. Since Lila has a loose connection to Damon – her quirky artist mother once dated him – she is placed in charge of making sure things go smoothly for his visit. This is of course before he vanishes. As each of the various events associated with Arts Week ends in disaster, Lila attempts to convince everyone that there is a saboteur in their midst. All the while also navigating her own complicated romantic entanglements. Cynthia Kuhn knows her setting very well. Readers will immediately recognize the dynamics involved in academic milieus. A brief subplot involving student plagiarism rings authentic and fitting for the other themes within The Art of Vanishing. Readers will also be able to feel the chill of the winter season as Valentine’s Day approaches for the characters. With everything from a stolen manuscript to an attempted poisoning occurring around the campus, readers can enjoy piecing the elements together to uncover the true nature of the threat. As with any series, much pleasure is derived by visiting with the characters who inhabit the world. Kuhn’s academic setting is suitably diverse and each reader is sure to latch on to their favorites. There is still much ground to be covered at Stonedale University so it is clear that Cynthia Kuhn is on a tenure-track in terms of her crime fiction career. Both she and Lila Maclean should be around for years to come. Very much enjoyed Cynthia’s first book and just picked up the new one. Glad to read this preview and even more excited now about diving into the book myself! Thanks so very much, Kristopher, for reading and reviewing! Art, that’s kind of you to say!